Since completing the 100mile Glasshouse Trail run in shoes in September 2011, losing eight toenails and getting incredibly swollen feet for about a week...as stated in previous posts, I made a big decision to ditch my shoes and train solely (pardon the pun) in my Luna Sandals (DIY kit) and completely barefoot for Hares and Hounds. After this race I would re-assess how/what I would run in. Yesterday was the big day! 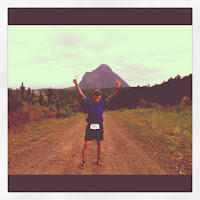 I was very excited to be doing my first ultra in my sandals and couldn't wait to get on the Glasshouse Trails. Hares and Hounds was the race I would be doing and is a race I haven't done before. How it works is the Hares (individuals) take off at 3:30am and the Hounds (teams of two to four) then take off at 4:30am and try to catch the Hares. My good friend Katie, who was a Hound with her sister Belinda, who we were staying with, kindly offered to drive me to the start so my dear wife and daughter wouldn't have to get up well before sparrow's fart! Well that was an adventure in itself...after getting lost and driving a heap of dirt road, I only got to the start line at 3:20am! I handed in my medical form and went to weigh in when the organizer spotted my sandals. 'Your'e not running in them are you?' was his question. With a big smile on my face, I politely replied 'Of COURSE I am!' After a quick Gday to all my friend (eight other runners from Bundy and a mate Ben from up north) and seeing a few familiar faces from previous races, we headed to the start line. Before long we were off. I trotted along with my dad in the darkness and up until dawn things were pretty non-eventful. The trail was very easy compared to what I had become accustomed to in the other Glasshouse events. As usual we got talking to a number of different people, quite a few who were interested in my choice of footwear. After the first aide station, I drifted off from Dad as he was taking it a bit easy and I was feeling good. The race was an out and back course and heading out, I chatted to many people and got to run a bit with my mate Ben who is usually miles ahead. He was running with a mate of his Sean in his first ultra. We hung together for a while and had a good laugh, including giving each other a hard time (he now runs in moonboots, sorry Hoka's) and eventually I again went ahead. On the way out, my feet did start to get a bit sore. This was due to the rough trail, something I struggle to find and train on in Bundy. I plugged on and kept smiling though. There is some incredible scenery at the Glasshouse Mountains and I managed to capture one of these upon making a turn and seeing Mt Beerwah in all its glory! I got to the turnaround point at 27.5km in just under three hours. I saw my beautiful wife and daughter here who are always the best cheer squad! Mum was also with them waiting Dads arrival. It was great to see them and sneak some sweaty kisses! I don't usually like to, but at this point I downed a couple of Ibuprofen tablets. 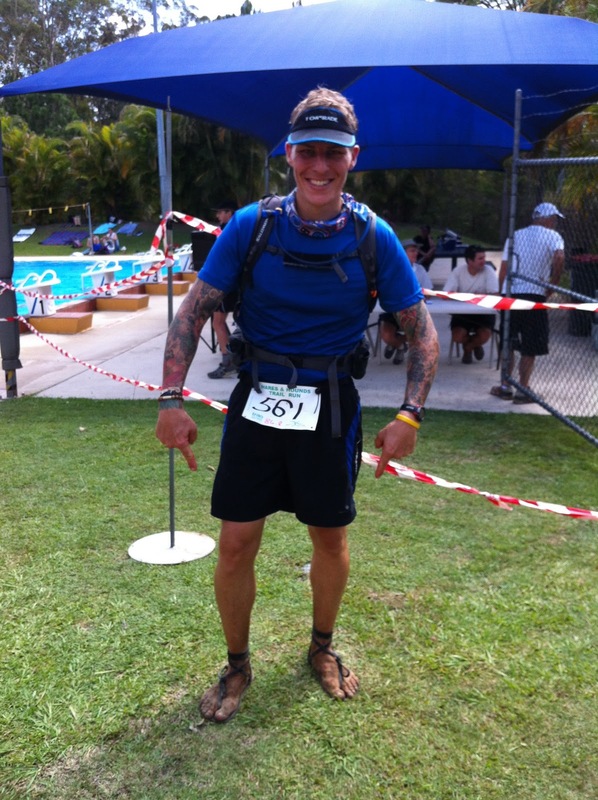 Given that this was my first ultra in my huaraches and my feet were hurting a bit, I wanted to stay on top of things. I headed off back the way I had came and was keeping a solid pace. I wanted to run a negative split (run the second half of the race quicker than the first). A bit of the way along I spotted a bloke John who Dad and I had run a fair bit of the last Glasshouse event with. He's a nice bloke and it is always nice to have company. I ran reasonably hard to catch him and then ran the next hour or two with him. We had good old yarns and plodded along at a good speed. After a few decent hills (finally) John told me to go ahead as he was going to take it a little easier. I ran ahead and continued to reel in other runners. I found a couple of the Bundy crew who had gone out too hard and were suffering in the heat. I got to Checkpoint 7, the last aide station and decided to not hang around long and keep moving forward. I again saw Tegan, Pria and Mum here. With about 5km to go, I was starting to feel the pinch a bit as it had gotten HOT! I continued to plod along and my feet were feeling quite good. The Ibuprofen seemed to do the trick (I recommend having these in your running pack however I don't recommend taking them unless you have to as they can cause significant kidney damage, especially in ultras) I battled with the heat and though I was going to cramp up in these last few k's. I downed some salt tablets and I pushed through however and finished to a loud cheer (and some confused faces) in 5hrs 56min and change. I would have been happy with 6-6.5hours in my first sandal ultra so I was stoked to go under the 6hour mark! Some good friends Scott, Tylana, Jaxon and Maddie who I had met at The North Face 100k last year, were there to meet me at the finish. They had taken part as a family in the shorter events. Tegan, Pria and Mum were also there with big smiles on their faces. After a few happy snaps, it was time to relax and have a swim at the Woodford Pool where the race ended. It was a super spot to hang out after such high temperature . My friends continued to trickle in, with some even taking a wrong turn (Bec...). A lot of competitors suffered in the hot temperature however all our crew were able to finish with a smile on their faces. Well done to all, particularly all the first time ultra/trail runners from Bundy, Katie and Belinda and Sean! Top job guys! So...the wash up! After the easiest Glasshouse Trail I have done by far, I spent much time chatting to people after the race, promoting correct running gait, showing off my DIY Luna Sandals, the benefits of bare footing and running in huaraches and how much I LOVE my new running life. I have a little swelling on the top of my left foot however I will NOT be going back to shoes and I love the complementary team of bare footing and sandal running. Amazingly (not really), I also still have ALL my toenails! HA! Again, I have very little leg soreness after the event and I put this down to the change in gait, my new choice in footwear (or lack there of) and of course my vegetarian lifestyle! Ha! I am now training for another couple of ultras, including another 50 odd k'er, a 50miler and then returning to my 100miler, however this time in huaraches! If anyone is interested in transitioning out of shoes and freeing you mind and body drop me a line! There is much information out there you can research about the benefits of bare footing, the reduction if not elimination of injury, the damage shoes cause, correct running gait etc. I LOVE my sandals and if you are keen on the type I have, go to www.lunasandals.com. There is A LOT of information on the site and some cool funny stuff from Barefoot Ted and his monkeys! Well crew, another adventure is down and now I have a heap more training to do so keep smiling, free your feet, give someone some flowers and keep loving life. Until next time...RUN ON!